PLEASE NOTE: some people with emetophobia cannot handle even reading certain words. I have not placed asterisks or edited words and phrases that may be a trigger for you! Emetophobia is an intense, irrational fear or anxiety pertaining to vomiting. And I have had experienced it, on varying levels, since I was a junior in high school. I know what some of you are thinking - NO ONE likes to get the yuckies. NO ONE likes to witness the yuckies. NO ONE likes to clean up after. My phobia grew as my depression and anxiety increased. The definition above really gets to the heart of it: "intense and irrational." It is extremely embarrassing, now, to talk openly about how this has played out in my head over the years. I'm saying some of this out loud because I know there are plenty of you out there that know exactly what I'm talking about, and also keep it to yourself. If someone talked about having been sick anytime in the previous week, I completely avoided them. If they had already shaken my hand, I created an invisible barrier around that hand. Until it could be properly washed, I made sure it did not touch any other part of my body, or any object. When my kids were young, I would avoid travel and certain situations, for fear they may come down with something while we were away from home. When someone in the house had been sick, I would put myself on the BRAT diet, barely eating for days. My thought process was that hopefully I would "only" have diarrhea, because my stomach would never be too full. When a big virus swept through the house, I would be utterly emaciated by the end of it all. When feeling sick, I would do whatever it took to keep anything from making its way back up. Always kept Phenergan pills and suppositories on hand. I discovered my pediatrician would prescribe them if the kids had a really bad bout that was lasting for more than 12 hours. So, by the time we filled the prescription, they no longer needed them. I kept them on hand for myself. Again, I told you. This is embarrassing. But it's true, and it was the way I functioned for years. I know it made no sense. That's the problem with phobias and panic attacks and severe anxiety. They don't make sense, but they are just as, or more real, than any other emotion you have ever experienced. If I witnessed someone being sick, my entire body flushed. I didn't feel nauseous. I felt terrified. I had zero empathy for that person, but only cared about personal survival. Yeah, I just said survival. I felt as though I could die if I caught a virus. I mean, I KNEW I wouldn't. I knew how rare that was. But it didn't take away that fact that I thought I may actually die. It was sheer terror. And after that flush, once I could get myself separated from the situation, I always had diarrhea. Adrenaline rush. I still do this. It's my last residual effect from my now diminishing phobia. We had him settled in the bathroom with a movie, and I crawled back into bed, I had time to reflect. This particular child rarely gets gastrointestinal issues. In fact, the last time he had something like this, was six years ago. Yeah ... SIX YEARS AGO! I remember it well, because it was one of my worst experiences with this whole phobia thing. I can look back now and understand that I was having panic attacks. Hearing him get sick. Waiting for the next round. Cleaning it up. Every little cough or wiggle or clearing of his throat sent me straight back into this frightening pit of despair. I was a mess. Pacing the floor. Could not sleep. Could not calm. My husband had a big event that weekend, and had to be gone the next morning. I called my mom and begged her, through tears, to come over and help out with the other two kids. I could not be alone. Have I mentioned it was "intense and irrational?" I honestly have feared death ... over ralphing. But last night, my sweet middle child came into our room during the night to wake us. He apologized for tossing his cookies away from any appropriate receptacle (yeah, he really is that kind and sweet ... he was apologizing!). I loved on him, in that awkward way a mom does with her now-11-year-old son who wants his Mommy but also doesn't necessarily want her in his business in the bathroom. I stayed up to help him with whatever he needed for the next few hours. Once I knew he was dozing off, I let myself fall asleep. I slept. Like a rock. Then, in the middle of this post, when my youngest got that look on her face and everything went into slow motion as I yelled, "Ruuuuuuuun tooooooooo theeeeeeeeeeee battttttttthhhhhhhhrooooooooooommmmmm!" ..... I just went into Mommy mode. Got her settled. And kept trucking. Don't get me wrong. If I catch this, I will be MISERABLE and hate the whole process. But I won't think I'm going to die. I'll WANT to die, but not think I'm GOING to. It may not seem like a big deal to most, but it is huge for me. To be sitting here typing away and checking in on everyone, and getting lunch made and EATING A FULL PLATE ... it is huge. In finding healing for my anxiety and depression, I have found healing from this, as well. Now, off to disinfect something! I have dealt with exactly the same level of "irrational, intense" phobia - not over this, but over medical issues/surgery, etc. And now I'm parenting a child with HIV. :) Cracks me up and fills me with thankfulness when I think about how far God has brought me! I really thought I was the only one!! Thank you, thank you, thank you for sharing!!! I feel nauseous just reading your post. That said, I just cleaned dry "you know what" on my son's rug b/c I didn't see it until it was dry. It was behind the door. Good for you for pushing through. You have come a long way! While I have never had a phobia about it, I definitely HATE it with a passion. I have an ultra sensitive schnoz and it just makes me not want to eat for a very long while if one of mine has to be sick. I ALWAYS have Phenergan in the house and in my purse when I travel. I won't tell you how long it's been since I last threw up because I'm afraid I'll jink my long standing record. I really don't see the problem in letting it work it's way through and come out the other end at a later date! LOL. Gross but true. Thank you for being so honest. I have the same phobia, and I never realized how it tied in to my depression. My depression is in remission (does it ever really go away?) and my phobia is *almost* in check. One of my greatest fears in becoming a mother is how to handle it when my kiddo gets sick. Congrats to you on handling it well. And I will definitely pray you don't get it, too!! THIS IS ME! Only I carry Zofran. I, too, starve myself for days and weeks when someone else is sick. I too run in the other direction...fearing not of the puke but for my life. I also had not aligned it to anything but an irrational fear of death...which I have in no other way...I mean, I'm not afraid of dying except by means of vomit. I always chalked it up to the fear of the Karen Carpenter demise.WOW.So much company in this. See...we are never alone...in any of life's seemingly one in a million customized little adventures. While this has never been an issue with me reading this and so many other things on your blog so helps me. I sometimes slip back into compulsive eating - a lovely residual from my bulimic days!! I have been trying to explain this to my family for years and my husband, while he doesn't truly GET it, now understands that it is not disrespect, selfishness or greed that make the bulk of the fridge contents and the kids sweets disappear occasionally, it is just a sign that things aren't OK with me. Reading your blog helps ME to understand that too. It helps me understand that I am not a bad person and it helps me surrender that little bit more to God's healing in my life. It helps me understand that feeling guilty that I am not as "damaged" as some does not actually help those other more damaged people, it just hurts me more and makes me less able to minister to them. Thanks Christine! Plus you make me laugh, which is always good. I also have also suffer from terrible anxiety attacks and a germ phobia (partly because I really do catch everything that goes around), not only do I have 3 kids of my own I work with about 75 kids each week, last winter I asked my boss if I could work with a surgical mask on…”um no, that might freak out the kids and their parents” well, they freak me out. Thanks for making me laugh! Strangely I am not so afraid of puking myself. I was just sick with the flu recently and hated it but dealt with it. But I am PHOBIC about being around vomit. I once RAN WAY from my husband on our anniversary while he puked his guts out in a public park. (Diabetes - high blood sugar.) The sound of someone vomiting traumatizes me. If I even sense someone is going to be sick in my general vacinity I have no empathy. I will plug my ears, not breathe through my nose, whimper, etc. Airplanes are the worst. I have a huge fear of being vomited on in an enclosed space. What is this about?? I have to warn travel companions ahead of time when I travel internationally for work. Just so they know that if they are ill I am NOT the right person to tell, ask for help, nothing. In fact, if I am sharing a hotel room and someone starts feeling ill I will immediately check into my own room. I didn't know anyone else on earth had this phobia. And I am wondering if it can be treated? Hoping you don't catch the crud too. oh my goodness. I thought I was the ONLY one! Seriously! How timely too, S was sick last night. Unbelievable! Thank you for this post = needed it big time! Not afraid of it. Just vomit too. Wimpy Wimpy Wimpy!!! Glad you are coming to grips with the fear though. Funny how those things can follow us for so long until we say "enough". NIce to read another person who has issues w/ vomit. I have half jokingly said I'd rather break my foot than vomit or deal w/ the stomach flu in my house. And that of course is the real reason I now have 8 kids and one of them has reflux (still) and the other has recovered tb and a hair trigger stomach and I could go on.....but you get the idea. UGHHHHH> I am not the compassionate mommy when my kids start up....I shout "run run to the potty" and frantically look for or call their dad (bc that will help somehow). Really, I'd rather deal w/ ghastly open wounds than puke. "tis the season for the stomach flu and I"m beating back the anxiety......pretending it won't happen to us this year. Right. thanks for the (empathetic) laugh, hang in there through these next few days or more!! prayers flying your way. Hey Christine, just realized it had be eons since I've stopped by to say hello. I noticed a tweet of yours and came over to visit & catch up w/ you via your posts. Saying hello now! Sorry you got sick kids, hope it skips you. Time to go (attempt to) put some kids to bed. Your description of panic and dread is how I imagine my daughter feels when she has to approach something new or unexpected. Which is daily, since she cannot control the world. I think it used to be how she felt all the time, but she is getting better, much better these days. Hope everyone gets well quickly! Over here we have all been dragging for weeks, but very little you-know- what, thankfully. Me too! 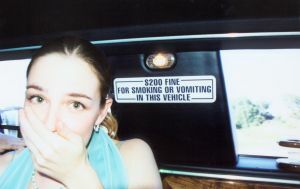 I haven't thrown up for 16 years! I know exactly how you feel.